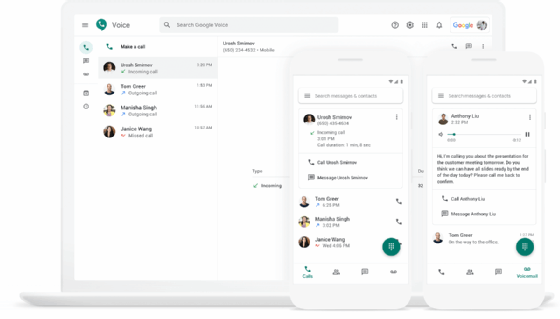 Google launched a business phone system and also released, in beta, several enhancements to its products for collaboration, messaging and web conferencing in G Suite for business. The introduction of Google Voice for G Suite at this week’s Google Cloud Next conference covers a gap in the vendor’s enterprise portfolio. At launch, the cloud service offers fewer features — and comes with a smaller partner ecosystem — than telephony systems in Microsoft Office 365. Google has certified one series of IP desk phones for Google Voice: the VVX series from Poly — formerly Plantronics and Polycom. Because it offers only basic features, the service should appeal to small businesses and small teams within a larger company. Google’s voice service supports voicemail transcription, call forwarding, auto attendants and e-discovery. It also gives IT administrators a console for managing phone numbers and tracking usage. Although G Suite performs well in the small-business market, Google has struggled to win enterprise contracts against competition from Office 365. “Part of the challenge for Google has always been how IT departments within larger companies view Google’s offerings, versus what they’re familiar with from a company like Microsoft,” Keitt said. Google will soon launch in beta support for Hangouts Chat within Gmail, letting users IM in the bottom left corner of the email dashboard. Hangouts Chat — a team collaboration app similar to Slack — will replace the consumer-focused messaging app Hangouts, which Google has supported in Gmail for years. Meanwhile, Google has added the AI voice interface Google Assistant to the G Suite calendar, so users can perform basic commands — like querying upcoming meetings — with their voice. “I expect that Google — who has impressive AI [and] machine learning, is now sharing a much stronger narrative and has added new enterprise customers — will continue to make a more compelling case for enterprise consideration,” said Wayne Kurtzman, analyst at IDC.